Expert witnesses commonly testify in trials. In court, an expert witness is defined as an individual having scientific, technical, or other specialized knowledge that can assist the trier of fact to understand the evidence or to determine a fact at issue. The types of people who can qualify as experts are very broad. Most commonly, expert witnesses are individuals possessing an advanced academic degree or individuals with uncommon experience operating machinery or performing unusual tasks. This link presents a general description of trial processes. Students participating in the Ohio State University mock trial. A unique aspect of being designated as an expert witness in a trial is the ability to express an opinion, rather than simply introducing facts. Expert witnesses must be qualified by the court before trial. Rule 702 of the Federal Rules of Evidence describes the application and limitations for qualifying experts and their testimony. Direct examination is the first part of a witness' testimony in a trial when the expert is asked questions by his or her own attorney. Because the plaintiffs put their case on first, the plaintiffs' experts often need to explain fundamental concepts to the jury. This is done with the attorney through the dialogue of questions and responses routinely seen on TV. 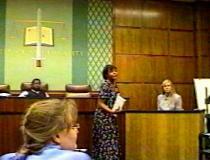 An effective expert witness is a good teacher and uses exhibits to convey salient points to the jury. Cross examination is the second part of a witness' testimony in a trial when she or he is asked questions by opposing counsel. It has been said that cross examination is the single most stressful part of the trial for a witness. Often a tactic of the opposing council is to attack the character of the witness and discredit their testimony. The textbook by Grossman and Vaughn, A Documentary Companion to 'A Civil Action,' lists 80 experts that could have testified during the Woburn Toxic Trial, which made the pool of experts in the trial one of the largest in history for a personal injury lawsuit. This bewildering statistic underscores how important it is for expert witnesses to present testimony in a manner that the jury understands and will remember. This link is a listing of who's who in the Woburn Toxic Trial and this link is a tabulation of the chronology of events in the Woburn Toxic Trial. Engaging students to embrace the role of an expert is key to the success and enjoyment of the mock trial. The videoclips of students in mock trials held at Ohio State University can be used to get a feel for the presenting and defending your opinions. Students who research the background and personality of their particular assigned expert, then proceed to develop a knowledge of the scientific principles that expert was intending to expound upon are critical to the success of the mock trial. 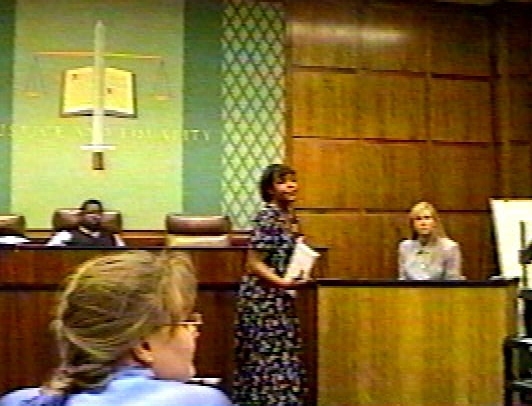 Although the personalities of Pinder, Guswa, Braids and Drobinski (all of whom were qualified as geologic experts for the trial) were not highlighted in the movie or book, copies of the transcript cannot fail to provide insight as to how their personalities may have affected the jurors perception of their capabilities and their opinions. Part of the trial preparation would include looking at some of the successes and failures of these individuals in the actual trial transcripts.